The route is spectacular, as we will cross the famous mountain of Taygetos so full of myths and traditions. Passing through ravines, tunnels, caves and green forests. Modern day Sparta, capital of the prefecture of Lakonia, lies on the eastern foothills of Mount Taygetos in the Evrotas River valley. The city has been built upon the site of ancient Sparta. To the southwest stands Mt. Taygetos. To the east of the city stands the Parnonas mountain range, which is forested predominantly with Greek fir trees and other pines. The origins of modern Sparta date back to October 20, 1834, when King Otto issued a decree on the construction of the new city. Bavarian city planners, headed by Fr. Stauffert, designed a city of 100,000 inhabitants based on the neo-classical architectural model. Today Sparta maintains its good design, boasting large squares and wide streets lined with trees, while many of the older buildings remain in excellent condition. 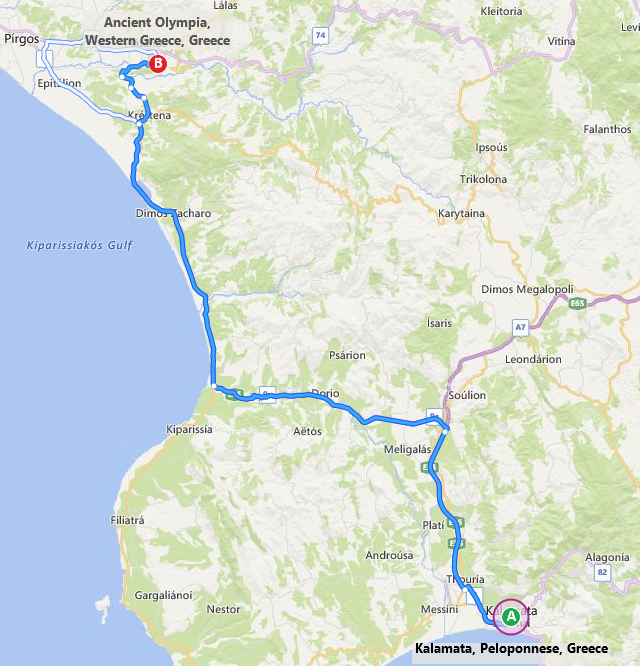 The city of Sparta is the economic, administrative and cultural center of Lakonia. A key factor in the advancement of the city’s development is the operation of two departments of the University of Peloponnese and a department of the Technological Educational Institute. Mystras or Mistras also known as Myzithras in the Chronicle of the Morea, is a fortified town and a former municipality in Laconia, Peloponnese, Greece. Situated on Mt. Taygetos, near ancient Sparta, it served as the capital of the Byzantine Despotate of the Morea in the 14th and 15th centuries, experiencing a period of prosperity and cultural flowering. The site remained inhabited throughout the Ottoman period, when it was mistaken by Western travellers for ancient Sparta. In the 1830s, it was abandoned and the new town of Sparti was built, approximately eight kilometres to the east. In September 1259, William of Villehardouin was defeated and captured, along with many of his nobles, at the Battle of Pelagonia, by the forces of the Nicaean emperor Michael VIII Palaiologos. Two years later, the Nicaeans recaptured Constantinople, putting an end to the Latin Empire and restoring the Byzantine Empire. At this point, the emperor concluded an agreement with the captive prince: William and his men would be set free in exchange for an oath of fealty, and for the cession of Monemvasia, Grand Magne, and Mystras. The handover was effected in 1262, and henceforth Mystras was the seat of the governor of the Byzantine territories in the Morea. Initially this governor (kephale) was changed every year, but after 1308 they started being appointed for longer terms. Almost immediately on his return to the Morea, William of Villehardouin renounced his oath to the emperor, and warfare broke out between Byzantines and Franks. The first Byzantine attempts to subdue the Principality of Achaea were beaten back in the battles of Prinitsa and Makryplagi, but the Byzantines were firmly ensconced in Laconia. Warfare became endemic, and the Byzantines slowly pushed the Franks back. The insecurity engendered by the raids and counter-raids caused the inhabitants of Lacedaemon to abandon their exposed city and settle at Mystras, in a new town built under the shadow of the fortress. From 1348 until its surrender to the Ottoman Turks on 31 May 1460, Mystras was the residence of a Despot who ruled over the Byzantine Morea, known as the "Despotate of the Morea". This was the city's golden age; according to the Oxford Dictionary of Byzantium, Mystras "witnessed a remarkable cultural renaissance, including the teaching of Plethon , and attracted artists and architects of the highest quality". The frescos in the Peribleptos Monastery Church, dating between 1348 and 1380, are a very rare surviving late Byzantine cycle, crucial for the understanding of Byzantine art. Mystras was also the last centre of Byzantine scholarship; the Neoplatonist philosopher George Gemistos Plethon lived there until his death in 1452. He and other scholars based in Mystras influenced the Italian Renaissance, especially after he accompanied the emperor John VIII Palaiologos to Florence in 1439. The last Byzantine emperor, Constantine XI Palaiologos, was despot at Mystras before he came to the throne. Demetrius Palaeologus the last despot of Morea, surrendered the city to the Ottoman emperor Mehmed II in 1460. As Mezistre, it was the seat of a Turkish sanjak. The Venetians occupied it from 1687 to 1715, but otherwise the Ottomans held it until 1821 and the beginning of the Greek War of Independence. It was abandoned under King Otto for the newly rebuilt town of Sparta. In 1989 the ruins, including the fortress, palace, churches, and monasteries, were named a UNESCO World Heritage Site. The famous Alepotripa and Vlichada caves are located in Pirgos Diros. They were explored by the speleologists Ioannis and Anna Petrochilos. The Alepotrypa cavern was discovered in 1958. Archaeological research begun in 1970 under the direction of archaeologist Georgios Papathanassopoulos. In the course of the late Neolithic period (4000 - 3000 BC), the cave was extensively used as shelter, dwelling, workshop, storage place for goods, cemetery and a place of worship. This led archaeologist G. Papathanassopoulos to the conclusion that these Neolithic people died suddenly during a strong earthquake, which in turn generated huge rockslides from the ceiling, thus blocking the cave's entrance. The passageways of Alepotrypa, decorated with stalagmites and stalactites, measure 500 m in length. The cave covers an area of 6,500 m2. The central cave ends in a very beautiful lake attaining a maximum depth of 6 m. The cave is not open to the public, yet. The cave of Vlychada covers an area of 16,700 m2 and since 1949 about 2,800 water passages have been explored. A 2.5-km-long winding passageway is the main route for sightseeing. During a 40-min boat trip, the visitor comes across an intricate network of passages and galleries, decorated with gleaming stalagmites and stalactites, whose reflection in the water accentuates their natural beauty. The guided tour into the cavern of Vlychada takes place by boat and on foot - part of it is on land. Nothing here betrays the troubled past of the city that is synonymous with the Battle of Navarino. Today it rests peacefully, built in the shape of amphitheatre below Neokastro, reminiscent of an island hamlet. Enjoy a leisurely coffee in the shade at the traditional kafenia in the central square of Trion Navarhon with its exotic palm trees. Visit the Archaeological Museum. Take a stroll along the coastal road and then sit down for dinner at one of its many restaurants. A little outside town you can admire Kamares, a section of the old water tower. Your holidays here will be heavenly. As soon as you cross the stone bridge with its 14 arches, flirting with the swell, you’ll be impressed by the castle and its imposing gate. A second and then a third gate lead you to the inside of the castle, where there was once a settlement. Among its remains is the pretty church, Transfiguration of the Saviour (Metamorphosis tou Sotiros), the Turkish Baths (that date back to the 19th century), the house of Ibrahim Pasha of Egypt and the Bourtzi (that was rebuilt by the Turks in 1500). It was originally built in the 13th century by the Venetians. The picturesque seaside new town of Methoni, with its low stone homes, one beside the other, with their lovely patios and fragrant flowers, will charm you and invite you to enjoy its beaches, cafes and restaurants. Archea Messene is a significant ancient city in terms of its size, form, and state of preservation, and still has much to offer. It possesses not only sanctuaries and public buildings, but also imposing fortifications, and houses and tombs. It enjoys, amongst other things, the advantage of never having been destroyed or covered by later settlements, and is located on an unspoiled inland site. Its natural setting combines the grandeur of the mountains of Delphi with the low-lying, riverine tranquillity of Olympia, the dominating bare limestone mass of Ithome, the site of the ancient acropolis, with the low fertile valley around the ancient city. Olympia a sanctuary of ancient Greece in Elis on the Peloponnese peninsula, is known for having been the site of the Olympic Games in classical times. The Olympic Games were held every four years throughout Classical antiquity, from the 8th century BC to the 4th century AD. Olympia was also known for the gigantic ivory and gold statue of Zeus that used to stand there, sculpted by Pheidias, which was named one of the Seven Wonders of the Ancient World by Antipater of Sidon. Very close to the Temple of Zeus which housed this statue, the studio of Pheidias was excavated in the 1950s. Evidence found there, such as sculptor's tools, corroborates this opinion. The ancient ruins sit north of the Alpheios River and south of Mount Kronos (named after the Greek deity Kronos). The Kladeos, a tributary of the Alpheios, flows around the area. 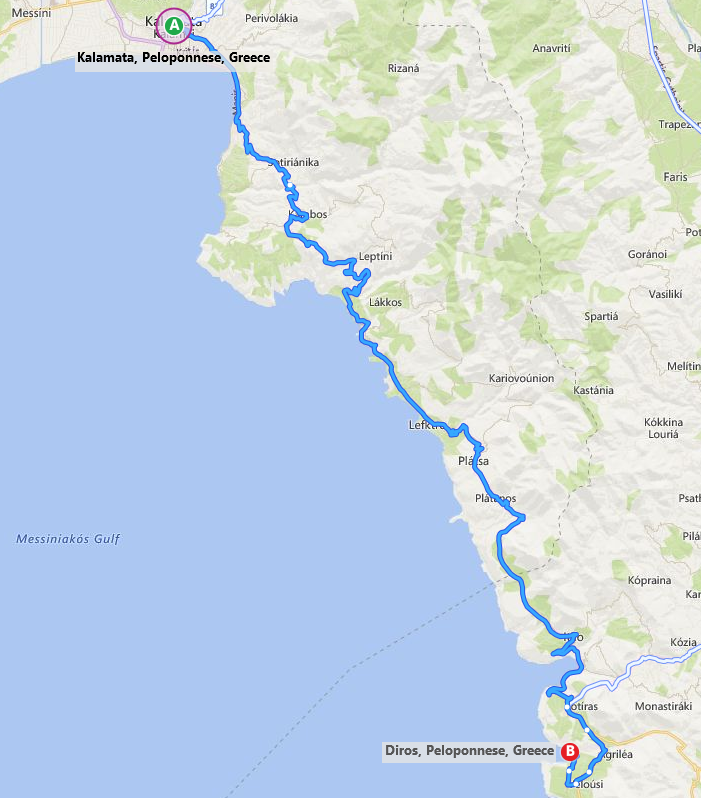 In Voufrado (32 km. 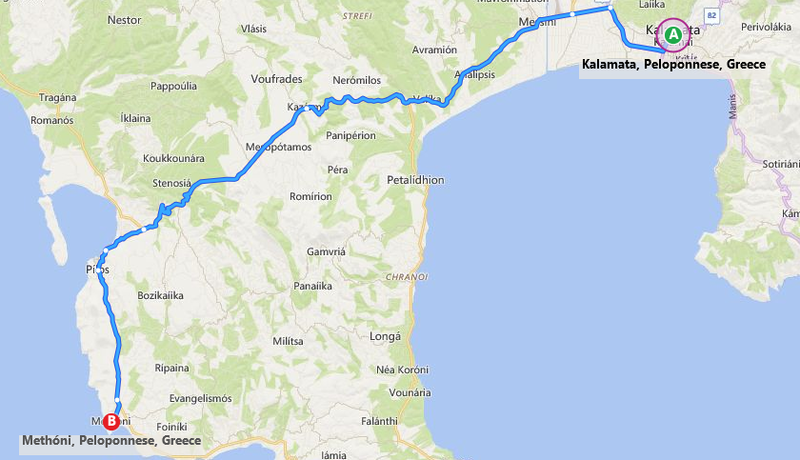 from Kalamata) you will find the canyon of Polylimnio. It is a hidden paradise of small lakes and waterfalls, surrounded by olive groves and vineyards. All the lakes have weird names such as Mavrolimna, Kadi, Kadoula, Lucky’s, Italian’s, Panagos, Stathoula etc. and were unknown to the general public until recently. In the summer many travelers visit the lakes. One of the most famous ones is Kadoula which got its name from its shape as it resembles a heart. The waterfall offers a unique experience to the bathers, while the adventurous ones can enjoy spectacular dives in the deep waves of the lake from the surrounding rocks. The waters of the gorge come from Mesopotamos and after they cross Tzanes Bridge at Petalidi, they end up in the Messinian Gulf. Moreover, in the canyon you can find a cave with beautiful butterflies. 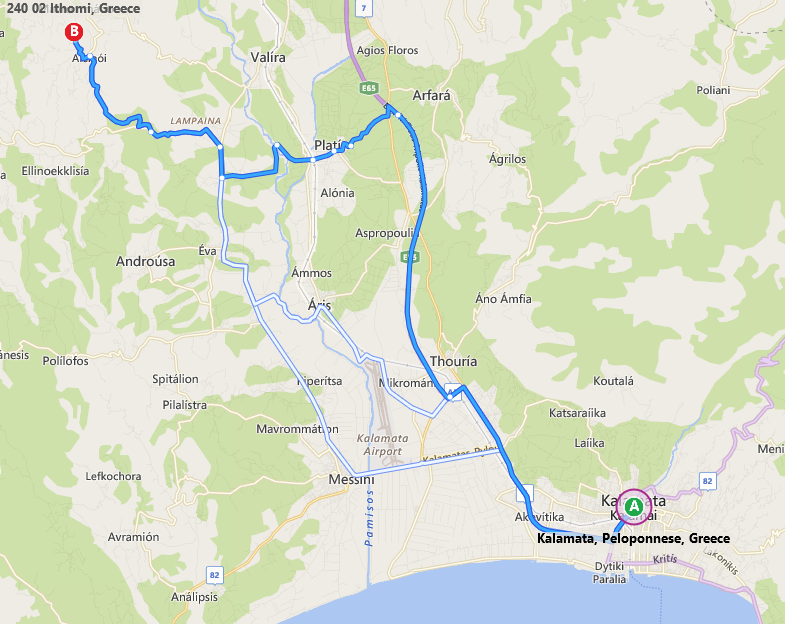 You can reach Polylimnio if you follow the road from Kalamata to Pylos. At Charavgi Village you will find the footpath that will lead you to the lakes.